State and federal agencies on Saturday managed to gain an upper-hand in the fight to clean up after a sunken barge spewed fuel into the San Francisco Bay. Thom Jensen reports. State and federal agencies on Saturday managed to gain an upper-hand in the fight to clean up after a sunken barge spewed fuel into the San Francisco Bay. Roughly 3,000 feet of booms supported by boats corralled the spill in hopes of containing the oil slick, which was originally spotted on Friday after a 112-foot freight barge named "Vengeance" sank, according to Coast Guard officials. The barge, located just south of the Bay Bridge, sent leaking diesel fuel into the bay, but divers managed to plug the leaking fuel Friday afternoon. But, as of Friday night, responders and investigators were still at the site executing cleanup strategies for the potential release of 4,000 gallons of diesel fuel and 300 gallons of hydraulic fluid, Coast Guard officials said. The Coast Guard is responding to a sunken barge just south of the Bay Bridge, authorities said Friday morning. 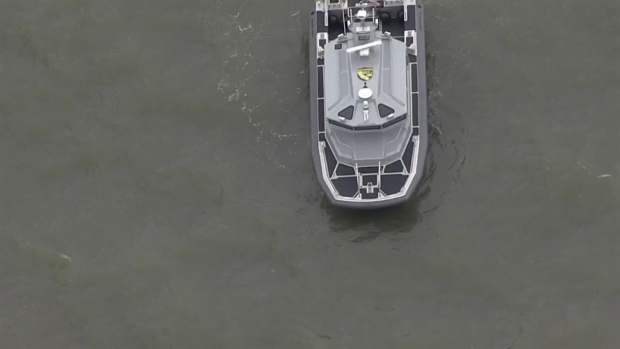 Petty Officer 3rd Class Sarah Wilson said on Saturday morning that a Coast Guard chopper had flown over the location where the barge went down. Pilots spotted a light sheen of oil on the surface of the water. But Wilson said that is a good sign because it means that the barge is not leaking as much oil as it was yesterday. Capt. Patrick Nelson added to that optimistic sentiment. "To this point, other than that small sheen, we haven't seen significant environmental impact," he said. Aside from the crews on the surface cleaning up the oil, divers swam on the sea floor to make sure the fuel vent plugs were still securely in place. 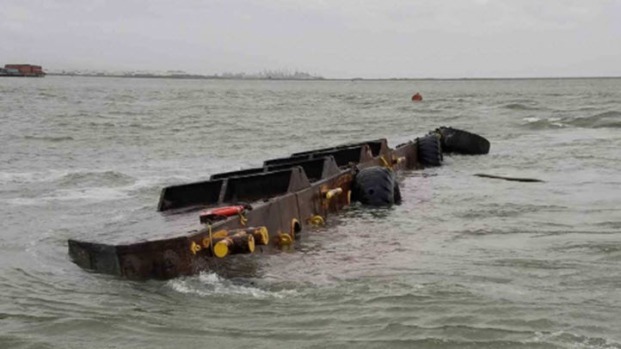 Coast Guard officials suspect that the barge sank during the storm’s heavy rain and strong winds on Friday. The cause remains under investigation. BART previously used the barge as a launch point for divers. Those divers would regularly launch from the large and conduct anti-corrosion work on the transbay tube. A freight barge that capsized south of the Bay Bridge early Friday morning is leaking and an unknown amount of fuel has gone into the bay, a Coast Guard official said Friday. Christie Smith reports. The U.S. Coast Guard, the California Department of Fish and Wildlife's Office of Spill Prevention and Response, the San Francisco Department of Emergency Management, Vortex Marine Construction and Bay Area Rapid Transit responded to the sunken barge, Coast Guard officials said.